은 헌종(재위 1834∼1849)이 효정왕후와 혼인할 때의 모습을 그린 병풍으로 크기는 각 폭 가로 115㎝, 세로 51㎝이며 비단에 채색 되었다. 헌종의 첫 왕비인 효현왕후 김씨가 헌종 9년(1843)에 죽고 이듬해 10월 효정왕후와 가례를 올렸는데 이 때 그려진 것으로 모두 8폭으로 이루어져 있다. 제1폭은 예식을 맡아보던 예문제장 조병구가 쓴 축하의 글이 실려 있고 제8폭에는 선전관청에 있는 사람들의 관등·성명·본관 등을 기록한 글이 있다. 그리고 제3∼7폭까지는 혼례를 치르는 장면과 함께 창덕궁 인정전을 비롯한 궁궐내의 모습이 질서정연하면서도 화려하게 그려져 있다. 140여년 전 궁중혼례 모습을 그대로 담고 있어 회화로서 뿐만 아니라 역사자료로서도 가치가 있으며 보관상태도 매우 양호하다. 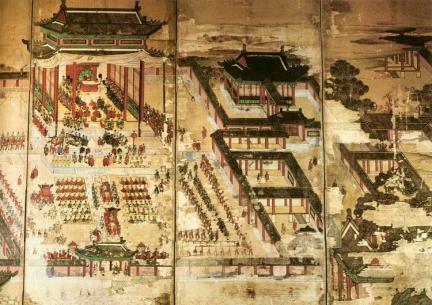 This folding screen depicts scenes from the wedding of King Heonjong (r. 1834-1849). It is made of silk and measures 115 cm in width by 51 cm in length. 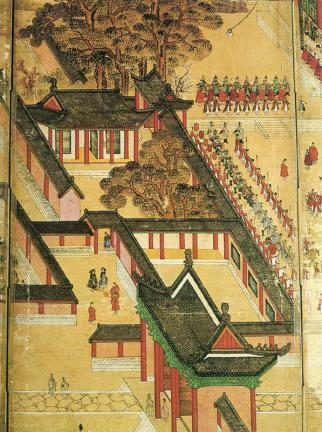 This eight-panel screen depicts the wedding ceremony of King Heonjeong and Queen Hyojeong, whom he married after the death of his first wife, Queen Hyohyeon of the Andong Kim clan, in 1843 (the 9th year of the reign of King Heonjong). 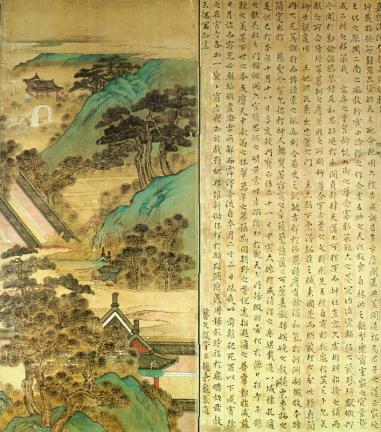 The first panel contains some words of celebration written by Jo Byeong-gu, the master of ceremonies at the wedding, while the eighth panel contains the names, titles and family clans of the participating officials. The wedding scenes and the interior of Changdeokgung Palace, including Injeongjeon Hall, are painted in magnificent fashion on the third to seventh panels. This well-preserved folding screen is considered both an extremely valuable artwork and an important historical material as it features scenes from a royal wedding held in the 19th century.